Zen is a Chinese Restaurant located by the Bristol harbourside on Millennium Square. It has been the restaurant of choice for myself, my friends Graeme, Kristine and her husband Andy for the last year or so. Along the way we have discovered a selection of dishes which make up an amazing dinner. Occasionally we will try a new dish or two such as ‘Smacked Cucumber’ or ‘Bang Bang Chicken’ but invariably the core components stay the same. ¼ Crispy duck for a starter, kung po prawns primarily for myself and Kristine, BBQ ribs cooked in a stone pot and egg fried rice for all, and aromatic chilli chicken primarily for Andy and Graeme. The crispy duck meat is brought to our table as the actual quarter of duck and the waiter then strips it off the bone with a fork before passing it over. Alongside is a dish of sliced cucumbers and spring onions. Only six pancakes are provided and usually the four of us have one each and then share the remaining two. However, on Sunday, we were brought eight after we mentioned we would all be sharing. The duck has so far been ample for all four of us and the quality of the meat is wonderful. I have not had better duck in Bristol yet, definitely not at Cosmo or at Mayflower. The Kung Po Prawn dish is a fascinating mix of king prawns and vegetables, mostly carrots and crispy things like celery, cut into small pieces and served on a big triangular white dish. The BBQ spare ribs cooked in a stone pot are soft and so tender that the meat falls off the bone as soon as you start eating. The marinated meat is permeated with the flavour and the sticky sauce is also a great accompaniment. The favourite dish for the guys is the aromatic chilli chicken which consists of cooked dry chillies and small southern fried chicken pieces. By the end of the meal the tears were nearly welling up and they were both slightly perspiring. 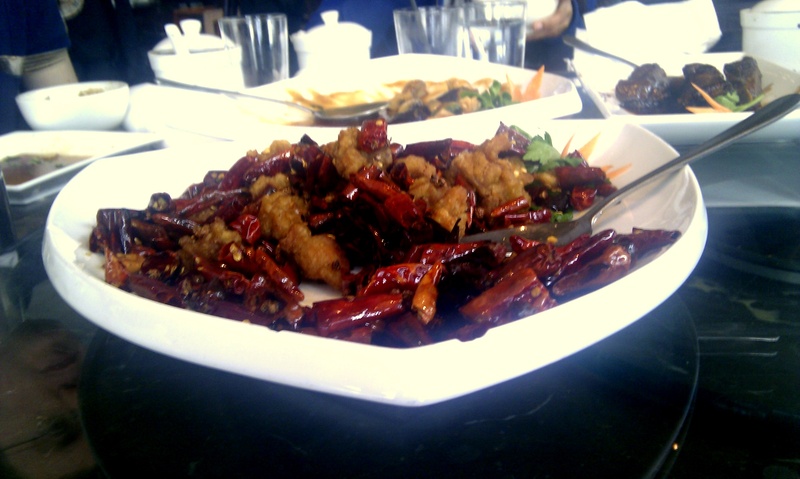 The dish is spicy with a lemon tang, it is also offered with a warning but this dissuades no one. The rice is well done and served in small white covered dishes. Two were enough for the four of us. I have yet to try dessert there but I have had a Zen mojito which included some lemongrass with the mint for that oriental twist. The house white wine has consistently been pleasant and the prawn crackers are brought to the table with a chilli dipping sauce. All in all, Zen is an excellent restaurant with a delicious choice of dishes which are not always your typical Chinese restaurant selections. The Smacked Cucumber was not entirely a success as it was served cold as was the Bang Bang Chicken which left an unpleasant sensation since the fat was still left on the chicken. However, the mixed meats noodles which contains seafood such as squid and prawns is a tasty and fresh tasting selection and the crystal rivers prawn dish has a green tea tinged glaze which is fragrant and unusual enough to be quite tasty. They currently have an offer through Toptable of 50% off until July 11. This entry was posted in Bristol, Food, Restaurants and tagged Bristol, Chinese restaurants in Bristol, Food, Millennium Square, restaurants, Zen. Bookmark the permalink.